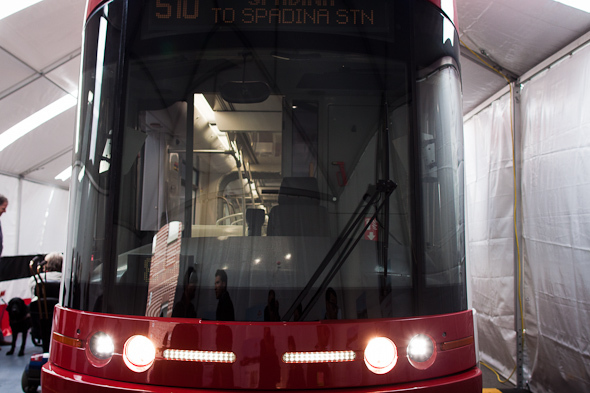 The new TTC streetcars are as slick-looking in person as they are on paper. Earlier today media were invited to get a peek at the future light rail vehicles, which are on display at the Hillcrest Yards (public viewing begins on Saturday). 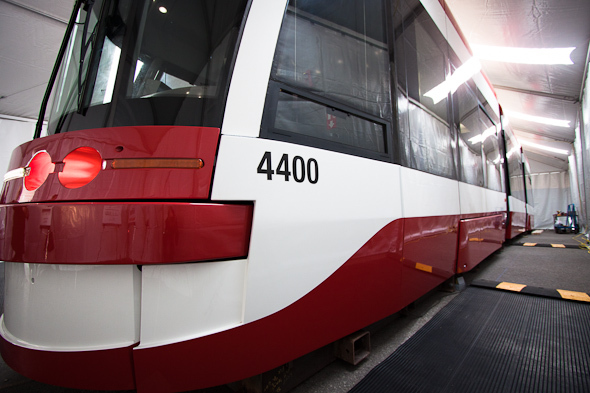 Although the first cars won't hit the Toronto rails until 2013, a full prototype â the version on display right now is only a mock-up â will undergo testing starting next summer. 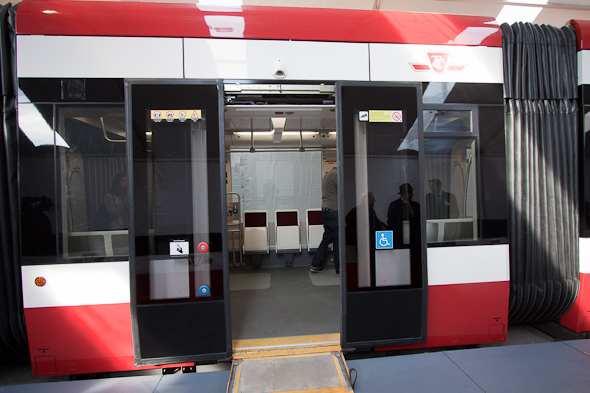 That's still a long time to wait for these vastly improved machines, but good on the TTC for creating a little bit of buzz for LRV. 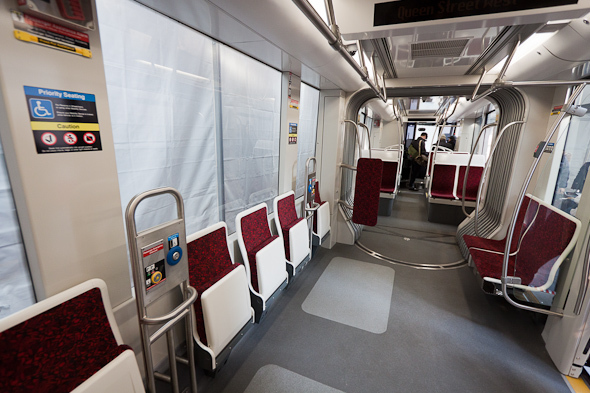 We already posted some basic info about the new cars when the TTC unveiled the new design last week, but actually getting a chance to walk through one gave a much better impression of what these things are going to be like to ride. The first thing that you notice is that despite the increase in size, there doesn't appear to be loads more seating. 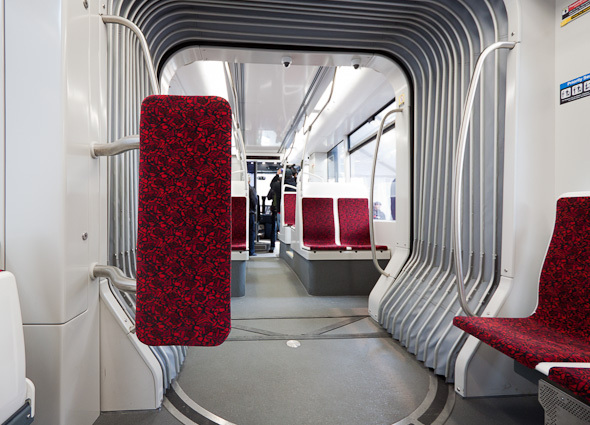 The current ALRV cars (you know, the double ones) offer 61 seats, while these new cars have 70. Where the biggest difference exists, however, is in terms of total capacity. 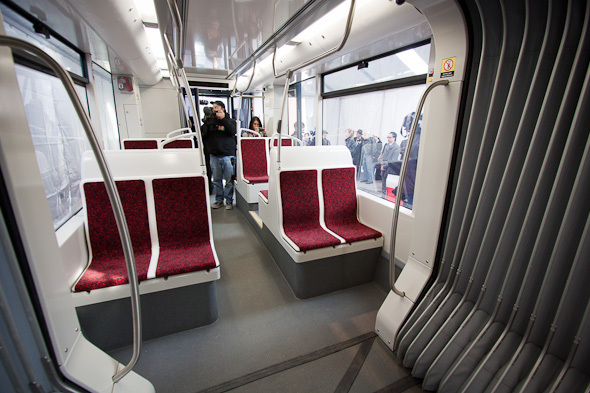 The new cars can accomodate 130 people, whereas the ALRVs hold 108, and the single car CLRV reaches its limit at 74. That may not seem like a huge increase, but when the new cars have been fully integrated into the system, which isn't expected until 2018, it will raise the fleet's rush hour capacity by almost 6500 passengers, which is 32 per cent gain. 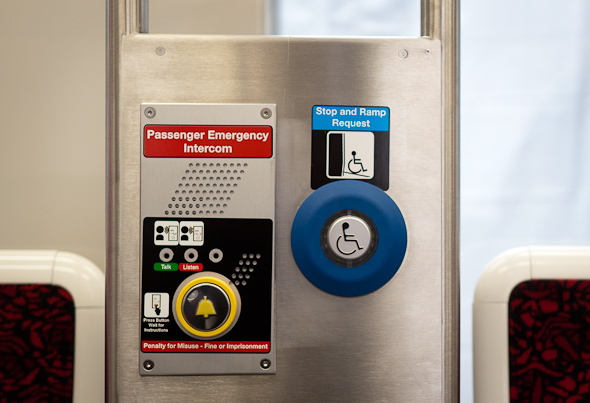 The vehicles are also far more accessible than their predecessors. Also noteworthy is that some of the side seats are back facing, meaning that you'll be placed directly across from your fellow passengers. That, I suspect, not everyone will like, but it doesn't look like it'll be too tight as far as leg room goes. And, hey, for tall people, the current front-facing seats are a bit of cram, so perhaps this represents an overall gain in comfort, just not in a social capacity. I'd also be willing to bet that there will be lots of people who will take the opportunity to put their feet on the opposing seats. 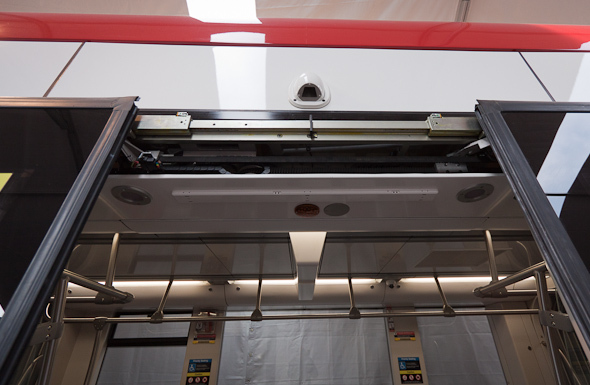 To the same degree that the design features of the new streetcars have been updated, so too will the payment system. The new cars will use proof of payment, which means that the driver won't handle fares. 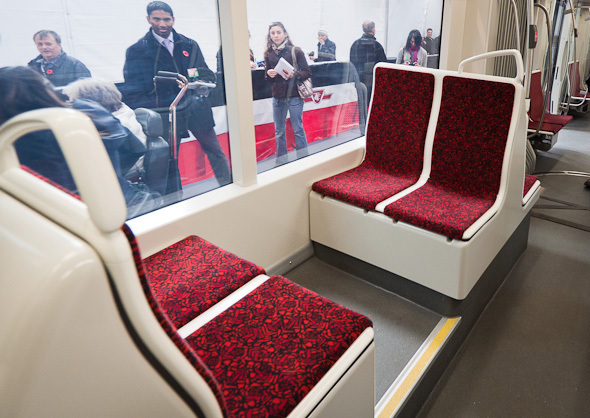 Instead the vehicles will be outfitted with a Presto card system and two ticket vending machines that will accept tokens, change and credit/debit (no bill). Enforcement of fares will be taken car of by roving inspectors. Perhaps the best news about this new payment implementation is that it will require the system to move to time-based transfers, something that many have been hoping would be introduced for quite some time. 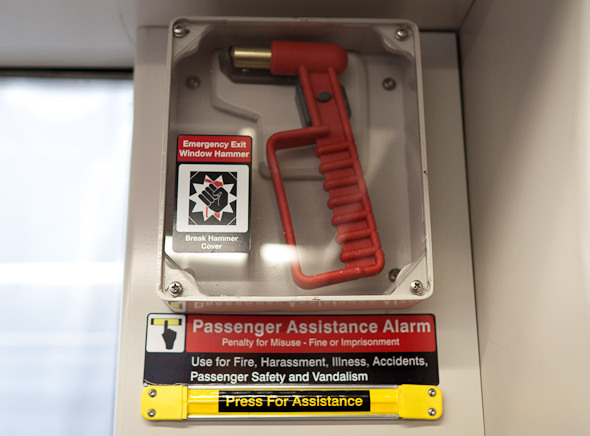 You'll be able to hop on and off for short periods without having to repay your fare. It all looks and sounds exciting. So if you're interested in a look at the future of Toronto's surface transit, head on over to Hillcrest to have a look. 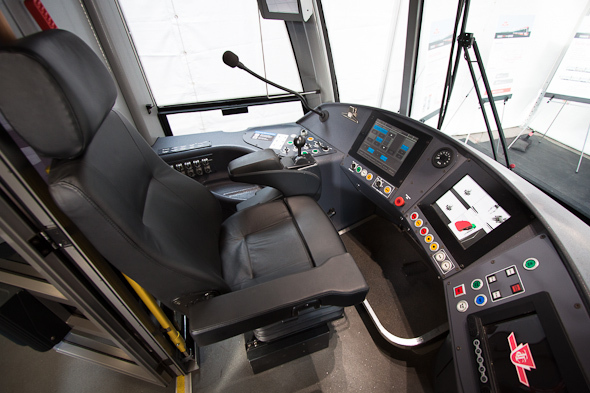 The mock-up LRV will be open to the public from November 12-15 (10 a.m. to 7 p.m.) at the Hillcrest yards.